New SiriusXM Music for Business activations will be granted a 3 Month Discount for a limited time. Easily make sure every song played within your business is licensed and legal via ASCAP, BMI, and SESAC. Take your in-store marketing to the next level by controlling what style of music your customers are listening to. Use your Smart Phone or Tablet to quickly change the pace of your business’ music with the SiriusXM Music for Business App. Add the power of the Grace Digital Radio Receiver to your streaming SiriusXM music, and completely automate when over 100 Music for Business Channels play and change throughout your business hours. You can even set it to both turn-on, and turn-off by itself. Free your business from the fear of expensive lawsuits for playing unlicensed music. 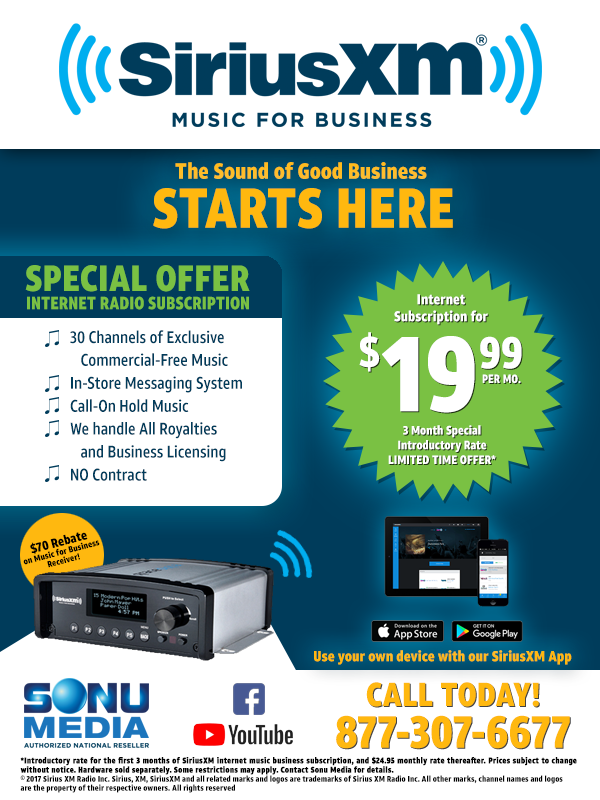 Activate your SiriusXM Music for Business service today, and receive your first 3 Months for $19.99p/m. Act now and receive a $70 Rebate on a Grace Digital Radio Receiver. Contact us for more information! Why is SiriusXM Music for Business the Best?